If a point P moves along a curve defined parametrically by P(t) = (x(t), y(t)), where t represents time, then the vector from the origin to P is called the position vector, with x as its horizontal component and y as its vertical component. The set of position vectors for all values of t in the domain common to x(t) and y(t) is called vector function. A vector may be symbolized either by a boldface letter (R) or an italic letter with an arrow written over it The position vector, then, may be written as or as In print the boldface notation is clearer, and will be used in this book; when writing by hand, the arrow notation is simpler. Thus, if the vector v is drawn initiating at P, it will be tangent to the curve at P and its magnitude will be the speed of the particle at P.
where we have used ax and ay for respectively. Examples 28 and 29 are BC ONLY. A particle moves according to the equations x = 3 cost, y = 2 sin t.
(a) Find a single equation in x and y for the path of the particle and sketch the curve. 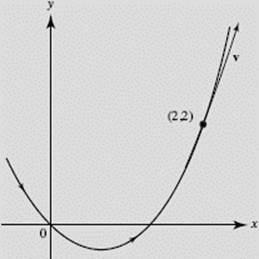 (b) Find the velocity and acceleration vectors at any time t, and show that a = −R at all times. (c) Find R, v, and a when (1) (2) t2 = π, and draw them on the sketch. (d) Find the speed of the particle and the magnitude of its acceleration at each instant in (c). (e) When is the speed a maximum? A minimum? and the particle moves in a counterclockwise direction along an ellipse, starting, when t = 0, at (3,0) and returning to this point when t = 2π. 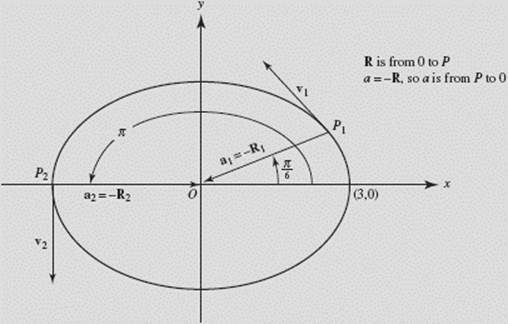 The acceleration, then, is always directed toward the center of the ellipse. The curve, and v and a at t1 and t2, are sketched in Figure N4–18, below. We see immediately that the speed is a maximum when and a minimum when t = 0 or π. The particle goes fastest at the ends of the minor axis and most slowly at the ends of the major axis. Generally one can determine maximum or minimum speed by finding setting it equal to zero, and applying the usual tests to sort out values of t that yield maximum or minimum speeds. 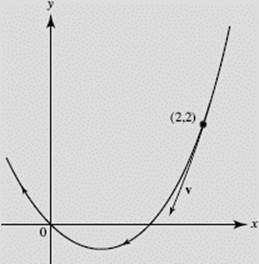 A particle moves along the parabola y = x2 − x with constant speed Find v at (2,2). Relation (3) holds at all times; specifically, at (2, 2), so that vx = ±1. From (1), then, we see that vy = ±3. Therefore v at (2, 2) is either The former corresponds to counterclockwise motion along the parabola, as shown in Figure N4–19a; the latter to clockwise motion, indicated in Figure N4–19b.